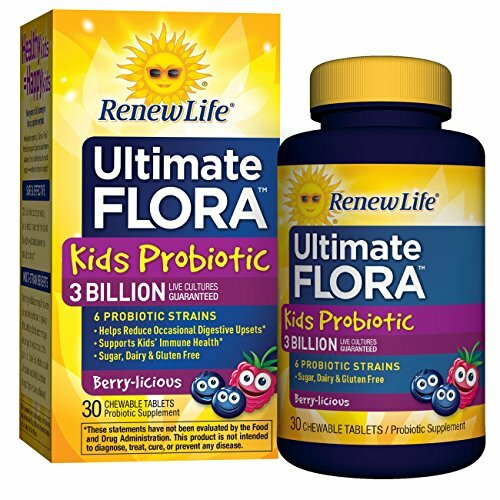 Keep your child's tummy in tip-top spirits every day with Ultimate Flora Kids Probiotic 3 Billion. This daily chewable probiotic is made with 6 scientifically studied Lactobacillusand Bifidobacterium strains to ease occasional tummy trouble and support digestive and immune health. Each tablet is bursting with delicious Berry-licious taste, and is naturally sweetened with tooth-friendly xylitol with no artificial sweeteners, flavors, or colors. These statements have not been evaluated by the Food and Drug Administration. This product is not intended to diagnose, treat, cure, or prevent any disease. * These statements have not been evaluated by the Food and Drug Administration. This product is not intended to diagnose, treat, cure, or prevent any disease. If you have any questions about this product by Renew Life, contact us by completing and submitting the form below. If you are looking for a specif part number, please include it with your message.